Following the release of Through My Mother’s Eyes, Michael began writing the screenplay adaptation of his book. On August 27, 2014, Under the Rising Sun was judged as one of the top 50 scripts in the 2014 Academy Nicholl Fellowships in Screenwriting in Los Angeles, in a record-breaking year of 7,511 entered scripts. On October 15, 2013, Under the Rising Sun was declared a winner in the Historical Dramas category in the prestigious PAGE International Screenplay Competition in Los Angeles. 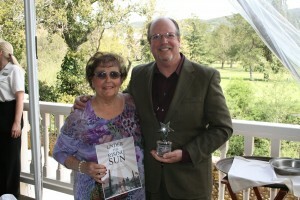 On September 12, 2011, Under the Rising Sun was named the Grand Prize Winner of the Creative World Awards International Screenplay Competition in Los Angeles. On March 28, 2010, Michael’s script Under the Rising Sun was declared the winner of the 2010 Northern California Screenwriters & Filmmakers Expo screenwriting competition in Napa, California. Read what columnist Chris Smith of the Santa Rosa Press Democrat says here. Michael is represented by Stephanie Rogers and Associates, Las Vegas, Nevada.